The sun is shining and the weather is beautiful in Tampa, Florida as the 13th annual 2016 National Biodiesel Conference and Expo gets underway. I had a chance to chat with National Biodiesel Board CEO Joe Jobe as he was in rehearsal for the opening general session on Tuesday and he was pretty excited about new EPA data that consumers used a record of nearly 2.1 billion gallons of biodiesel last year, demonstrating biodiesel’s rising popularity and really setting the stage for a new optimism in the industry. 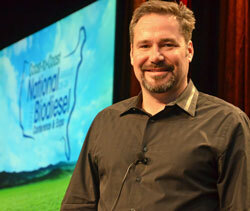 The theme of the biodiesel industry’s 13th annual conference this year is Coast to Coast, which Jobe says reflects the diversity of the fuel. “That diversity gives us a certain amount of strength in terms of our policy and how we utilize very diversified regionally abundant feedstocks,” said Jobe. The conference really gets underway Tuesday morning when the Expo hall opens and Jobe will lead the opening general session with his state of the industry address. “It’s going to be perhaps the best conference we’ve ever had,” Jobe added. Check out the agenda here.